Control your anger don't let it control you! Control your Anger, Don't let it Control You! Anger can be a paralyzing and debilitating condition. But it can be a terrifying and degrading experience for your child if you're taking your anger out on them. Physical and verbal abuse of a child can have lasting and lethal implications, so it's crucial that as a parent, you do whatever necessary to get your anger in check. As a parent, you have a wonderful opportunity to undo the wrongs that were done to you as a child if you had an angry and abusive parent or parents. Perhaps your past is filled with unresolved hurt and anger. If so, take the necessary steps to heal yourself. If you don't, you could unwillingly and unthinkingly harm your child. 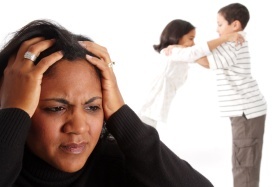 Studies have shown that children whose mothers often express anger are more likely to be difficult to discipline . Identify problems from your past and honestly look at current situations that are angering you. Maybe you aren't fulfilled at work; perhaps your spouse and you are having relationship troubles, maybe you have other personal issues or unfulfilled goals that are bothering you. If all your child ever sees is your angry face and hears an angry voice, that's what they'll most likely grow into as well. It's important to 'pick your battles' when parenting. Accidents and nuisances don't warrant the energy and agony it takes to get angry. But misbehaviors such as a child hurting themselves, others or property demand a firm, quick and appropriate response from you. You will probably have to continually remind yourself that the small stuff isn't worth getting worked up over. And remind yourself also that you're the one in control of your anger; don't let your anger control you. Put yourself in time out, take a deep breath, walk away! Do whatever you have to in order to get a grip on yourself before addressing the situation if you feel your anger coming on strong.